Owens & Minor (OMI) has never cut its dividend since it began paying one in 1977. The company breezed through the financial crisis, growing revenue by 20% while raising its dividend 35% between 2007 and 2009. 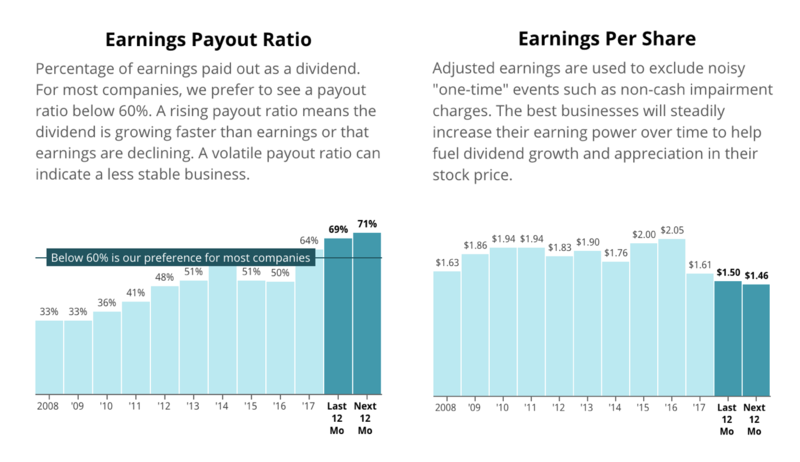 For much of the past two decades, shareholders have been rewarded with annual dividend increases north of 10%. But things have changed. Owen & Minor's last dividend increase came in at under 1%. Earnings fell 21% in 2017, and the company's stock has lost 62% from its peak in 2016. What's happening to Owens & Minor, and how safe is the company's dividend? Owens & Minor's core business is the distribution of medical supplies to hospitals and other healthcare providers. The company is a middleman that makes profits by charging customers a small markup on the cost of products sold. Competition is fierce, margins are razor thin, and the fixed costs of running a national distribution network are high. Owens & Minor's problem starts with the recent financial struggles of the healthcare industry. According to the credit-rating firm Moody's, operating cash flow at hospitals decreased 4% in 2016 and is expected to continue falling 2-4% through 2018. Revenue is on the decline as insurance companies reimburse hospitals less, while expenses are on the rise due a shortage of medical professionals and the need to make large investments in technology. In short, Owens & Minor's customers are less profitable than they once were, and the company is feeling the pinch as their customers seek to cut costs. To make matters worse, Owens & Minor lost a major customer in 2016 that accounted for 7.2% ($525 million) of the company's total revenue. The customer, Kaiser Permanente, signed a contract with rival Cardinal Health, presumably because of better terms. If that weren't enough, the company has had to invest heavily in technology to remain competitive and to improve efficiency to fight deteriorating margins. Combined, these issues led to earnings per share falling a steep 21% in 2017 as sales slipped 4.2%. 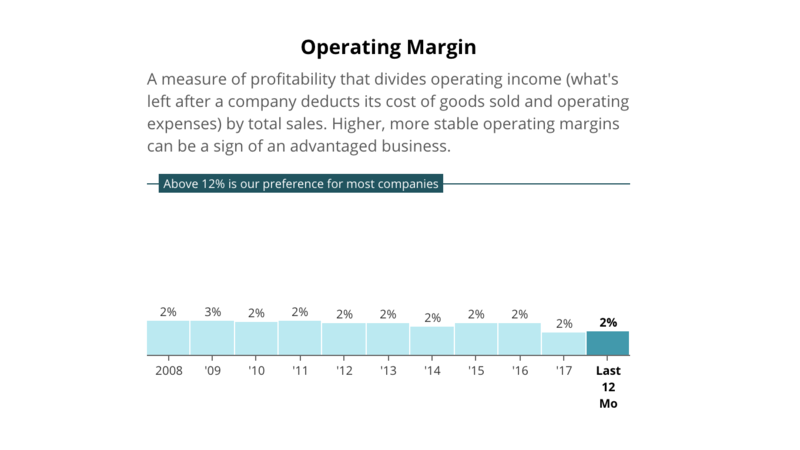 The large drop in earnings relative to sales underscores the high fixed costs of warehousing and shipping, which the company must cover regardless of how many customers it serves or medical products it sells. As a result, the company's payout ratio rose to 64% in 2017 and is expected to remain above 70% over the next year. This payout ratio is edging towards the high side and leaves the firm without much cushion to pay the dividend should conditions worsen. The challenges to Owen & Minor's core business aren't expected to recede, and management has responded by expanding to new, faster-growing lines of business. In early 2017, the company acquired Byram Healthcare, a national distributor of medical supplies directly to patients' homes. Later that year, the company announced its acquisition of Halyard Health's Surgical Infection & Prevention (S&IP) business, a designer and manufacturer of medical products. Together, management expects these more profitable businesses to generate over a billion dollars in annual revenue (more than 10% of the company's total revenue) and return the company to slow but positive earnings growth over the next three to five years. However, these acquisitions came at a major cost. S&IP cost the company $710 million, while Byram was bought for $380 million. To fund these purchases, the company took on new debt. And a lot of it. The firm's total debt ballooned from $569 million in 2016 to over $1.7 billion today. In conjunction with falling earnings, the new debt has caused Owens & Minor's credit metrics to enter dangerous territory. The firm's net debt to EBITDA ratio has risen to 5.9, and the company's interest coverage (which measures how much of operating income is spent paying interest on debt) has dropped to around 4. The increase in financial leverage caused Moody's to downgrade its credit rating of Owen & Minor's from Ba1 (one rung below investment grade) to B1, a solidly speculative rating. So how does this all impact the dividend? If everything works out as hoped, management may be able to continue paying the dividend while transforming the business. The company's core business (which still accounts for the majority of profits) could stabilize, providing much needed cash flow to pay back debt and reduce its debt burden. However, management is skating on thin ice. Should the company hit any bump along the way, the dividend would be in jeopardy, as companies will always prioritize interest payments on debt over optional dividend payouts. There's no longer any room for error. For one, the company can ill afford to lose another large customer. But with the healthcare industry reeling from lower profits and regulatory uncertainty, healthcare providers are looking harder than ever for ways to cut costs. Owens & Minor has numerous competitors waiting to snag contracts when they expire. In fact, Owens & Minor's contract with its largest customer, Vizient, is up for renewal in 2019. Vizient accounts for a whopping 43% of Owens & Minor's revenue. Vizient is a Group Purchasing Organization (GPO) that represents a number of independent hospital systems, so it's unlikely Owens & Minor would lose this entire piece of business, but there's plenty of risk that worse terms will have to be accepted given the company's heavy reliance on a single contract. It's also worth mentioning that Amazon recently revealed plans to become a major supplier to hospitals. Management may find that the company's core medical supply business requires more investment than expected to compete against Amazon and others, further straining the company's ability to pay the dividend. Finally, as with any major acquisition, it's possible that significant positive contributions from Byram and S&IP fail to materialize. A lot has to go right for an acquisition to be successful: cultural fit, cost savings from synergies, not to mention the acquired businesses have to continue to perform well. If management's strategy isn't successful, the company's large debt burden will likely leave the firm without viable options to pivot and fund new business ventures, at least not without first cutting the dividend. All said, there a number of events that could spur management to cut the dividend. Meanwhile, the only event that would keep the dividend safe is no further declines to the company's core business, no unexpected significant investments to remain a competitive distributor, no major disruption in the industry from the likes of Amazon, and each of Byram and S&IP have to prove successful acquisitions. Despite having been a dependable dividend payer for over 40 years, Owens & Minor is now in unchartered territory. A dividend cut may not be right around the corner, but the dividend is at much greater risk than it's probably ever been in the past. Owens & Minor's Dividend Safety Score is 19, which means its dividend appears much less safe than the average company's. Our Dividend Safety Scores are conservative in nature and take a long-term view of a company's risk. In part because dividend payments are discretionary, it's hard to forecast what will happen to Owens & Minor's dividend. But what is clear is that Owens & Minor has a challenging business model that doesn't fit our standards for quality and long-term visibility. Just two weeks after this article was posted, Owens & Minor cut its dividend by 71%, sending OMI's stock price tumbling by more than 40%. Many of these situations can be avoided well in advance. Our Dividend Safety Score system rated the company as "Unsafe" for more than nine months. 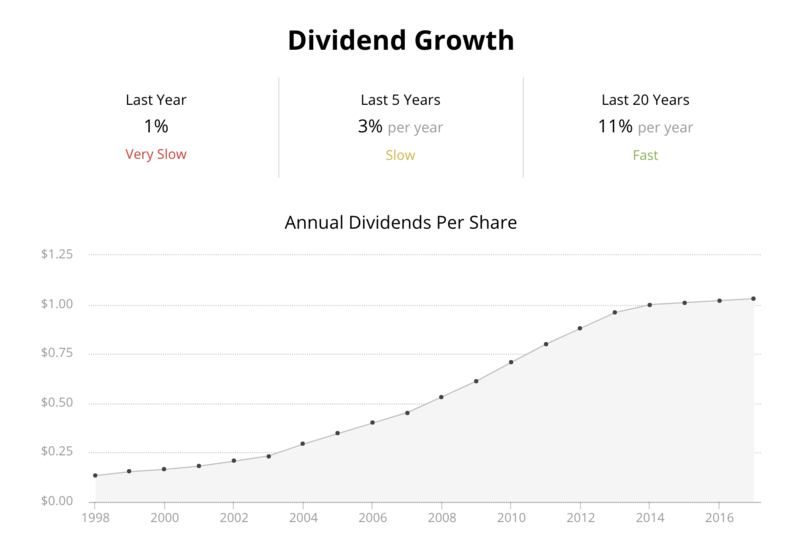 You can view our realtime track record here or sign up for a free trial of our website to see Dividend Safety Scores for companies in your portfolio.